Guided tours usually start at 2:30pm, and at noon on the occassion. Guided tours of the Mount Teide Observatory take place daily throughout the year except on Saturday. We are comparing Tenerife: Mount Teide Observatory Guided Tour Prices from leading ticket suppliers and Try to find you Cheap tickets prices on the market. The Mount Teide Observatory is the largest solar facility in the world, and the guided tour of this place reveals many interesting facts about the sun and astrophysics. Also, this observatory is one of 3 best places for exploring the sky on earth. The guided tour includes a film about the sky above the Canary Islands, observing the sun and a tour of the professional night scope. Here, you will be able to examine the sun with complete safety and observe its flares and sunspots. The solar observatory also disposes of different areas that are introduced during the tour. The facility also has many telescopes for daytime and nighttime observations that vary significantly in size. This enriching guided tour is especially interesting to people interested in astrophysics, scientific research and the space outside of our world. Also, if you dream of working in one such facility, the tour of the observatory will delight you. Your Experience With Tenerife: Mount Teide Observatory Guided Tour? During this enlightening tour, you will learn a lot about astrophysics and how scientists examine the universe. In addition to interesting lessons, you will have a unique opportunity to safely examine the sun. Furthermore, you will watch a short film that shows how the sky above the Canary Islands looks like. Walk grounds of the largest solar observatory in the world. Also, you will get yourself acquainted with the everyday routine of the people that work here. What Tenerife: Mount Teide Observatory Guided Tour Includes? 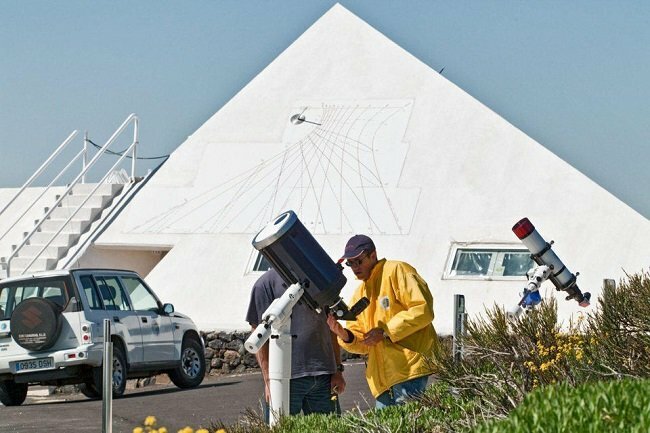 The ticket to the Mount Teide Observatory combines entry and the guided tour of the place. During the guided tour, you will gain access to 3 different scopes. Through 2 of these scopes, you will examine the sun. The 3rd scope is a professional night scope. At this spot, you will find many big telescopes, but during the day, you will use the small ones to safely examine the sun. Most of the guided tour takes place outside, so prepare accordingly. If you suffer from altitude sickness, consult your doctor before booking this guided tour. Travelers Reviews about Tenerife: Mount Teide Observatory Guided Tour? Ratings of this experience on Get Your Guide and TripAdvisor websites are 4.6 and 4.5 (out of 5) respectively. Participants in this tour describe the activity as very interesting. For the most part, they enjoyed the performance of tour guides. Most of them found observing the sun quite interesting. The guided tour of the Mount Teide Observatory isn't wheelchair friendly. You can present either mobile or paper voucher in order to take part in this activity. In case of timely cancellation, you will receive the full refund. Note that it is usually colder on Mount Teide than below, so prepare warm cloth regardless of the season. If you have issues with breathing, heart or something else, consult the doctor before you book this tour. Due to unfavorable weather conditions, the guided tour may be cancelled. Some things you are almost 100% sure to need during this tour are water, sunscreen and sunglasses. The starting point of the tour is Mount Teide Observatory, located at "Km. 37" on the TF-24 highway. Duration: This outstanding trip to La Gomera Island lasts around 9 hours. Duration: This sightseeing and gastronomy tour lasts around 8 hours. Duration: The duration of the cable car ride is approximately 8 minutes in one direction. Duration: The guided tour of the Mount Teide Solar Observatory lasts around 1:30 hours. Duration: The luxury yacht cruise with a stop for swimming and diving lasts approximately 3 hours.